Electroplating is process of covering an item with metal. While it takes a great deal of practice to achieve perfect results, it is possible to electroplate leaves at home using an electroplating kit. 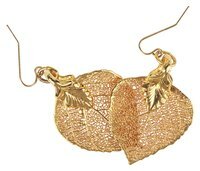 You can create an unusual, beautiful piece of jewelry or home decor, and preserve the delicate form of the leaf in shiny metal. Choose a leaf with a pleasing shape, and dip it in the sealer solution for 30 minutes. Allow it to dry, then dip it again, and let it dry completely. Wrap the base of the leaf in 18-gauge copper wire. Paint the leaf on both sides with the copper conductive paint, and allow it to dry. Dip it in tinning solution for 30 seconds. Hang the leaf into the electroplating tank filled with copper plating solution. Attach the power supply and plate for one hour. Remove from the copper solution, and gently sand any rough spots. Continue plating for three to five hours, removing hourly and sanding gently. Remove the leaf and rinse it with water. If desired, you can plate a different metal over the copper with another electroplating kit. The electroplating kit contains hazardous chemicals. Follow all warnings and instructions in the kit carefully. Finishing Dot Com: How do you electroplate flowers, leaves, animal skulls, and other organic materials?